Jeffrey Posner is definitely a “guys” guy, with a teaching style that gives his classes a slight testosterone boost. All of which isn’t really surprising considering that he was a bit of a jock in college, playing lacrosse and football, while also putting in time wrestling. 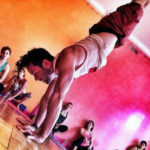 While his teaching style is very guy friendly, it’s his passion for teaching students how to make their dreams of doing inversions and arm balances a reality that make his classes and workshops popular with both men and women. You see Posner is a wee bit obsessed with showing students how to use their hands to make sure these poses are pain-free, much easier to do and fun. YogaCity NYC’s Dar Dowling recently caught up with Jeffrey to find out more about how he found his way out of the locker-room and onto the mat.